The Italian Street Festival happens Saturday and Sunday, June 23–24, in downtown San Rafael. Saturday, 10am to 8pm; Sunday, 10am to 6pm. $10–$15; kids 12 and under are free. italianstreetpaintingmarin.org. For more info on Barbosa, visit livepainter.com. GUITARS AND CANVAS Neal Barbosa (left) joins musicians like Danny Click onstage to paint when they play this weekend at Italian Street Painting Marin in San Rafael. Live music makes people do all sorts of things. Some folks are compelled to dance, some can't resist singing along and some feel the need to shout "'Free Bird'!" 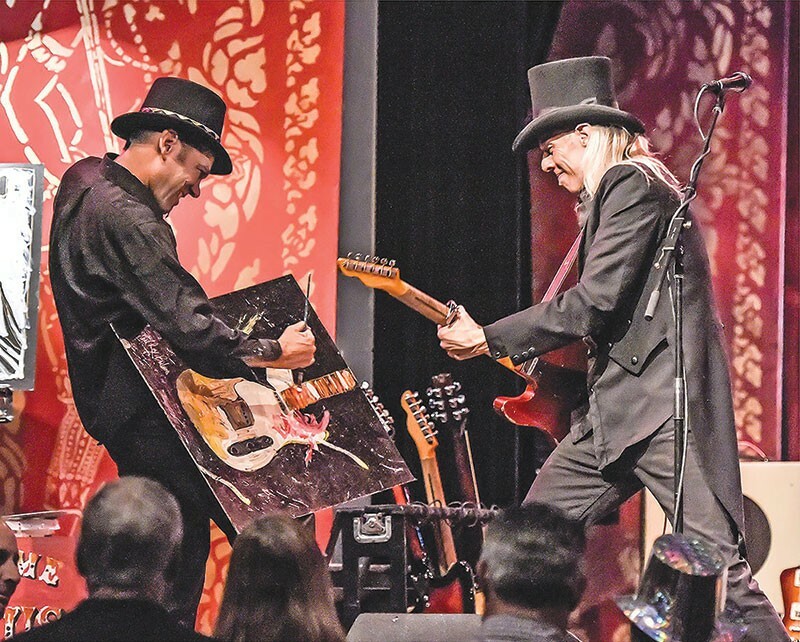 For Neal Barbosa, live music puts him in the mood to paint, and he does it onstage while bands perform at venues throughout the Bay Area and beyond, a practice known as live painting. Originally from Orange County, Barbosa was already a talented young artist when he moved to the North Bay at age 15 to live with his "hippie uncle." "He introduced me to all kinds of music that was going on around here," Barbosa says. "I really wanted to be involved in that, but I didn't play an instrument at the time, so I asked myself, 'What do I do?' And I came up with the idea of live painting." Barbosa isn't the first to paint live onstage; artists like Denny Dent have been painting along to live music since the 1960s, though Barbosa didn't know about Dent when he started. Evolving organically over the last 15 years, Barbosa's live painting was born out of a love for music and art, and his work synergizes both creative endeavors. "I've worked with so many bands that like it, because it's something new and something that gets the crowd going," Barbosa says. "I've had musicians tell me that they can feel my energy, and vice versa, and it sparks them to do something a little more." Barbosa originally went to gigs without a clue as to what he would paint, but he's refined the process in the last decade and a half. These days, he'll sketch out several rough ideas before the set so the crowd can watch a piece take shape in a timelier manner, usually over the course of three to five songs. Some pieces are portraits, some are abstract; Barbosa says it all depends on what energy he taps into once he hears the music. Barbosa has painted onstage with artists like Les Claypool, the Wailers, the New Mastersounds, Eric Lindell and others. This week, he'll be on an outdoor stage in downtown San Rafael, painting along to live sets by Danny Click & the Hell Yeahs! and Moonalice at the annual Italian Street Painting Marin fine art event on June 23–24. For this annual showcase's 2018 theme, "Wonders of Space & Time," Barbosa is incorporating images of celestial bodies into his planned live paintings, which will be available for sale after they're completed. "I'm really excited about it," Barbosa says. "I'll be painting with both hands."